The Best High School Yearbook (Parody) Ever! I will admit right up front that I love high school yearbooks – any and all. This love affair most likely began in June 1961 when I was a mere child of eight. My big brother, who was finishing up his junior year, brought home his yearbook. (For whatever reason, I don’t believe he bought the yearbooks from his freshman and sophomore years, probably because they cost some outlandish amount of money like $7.) However, I was riveted by that 1961 yearbook filled with photos of attractive teenagers and their many activities. And it was even better the following year when I could see my own brother in many of the photos that chronicled his senior year. I was probably fascinated all the more because, as the editor of his yearbook, my brother talked about its production throughout the school year. Fast forward seven or eight years to my own high school days. Again, due to cost, I didn’t purchase my freshman yearbook. However, after that, I made sure that a copy was reserved for me come June. It was great fun pouring over the pictures and collecting the signatures of friends, classmates, and teachers. And, like my brother, I ended up as an editor-in-chief of the yearbook in my senior year, too. The humor of a high school yearbook wasn’t lost on me. Certainly, there were photos of teachers that produced snickers. There were names of underclassmen that were funny. Occasionally, there was a photo that was humorously awkward. Sometimes inappropriate things managed to sneak in without the adult advisors catching them. 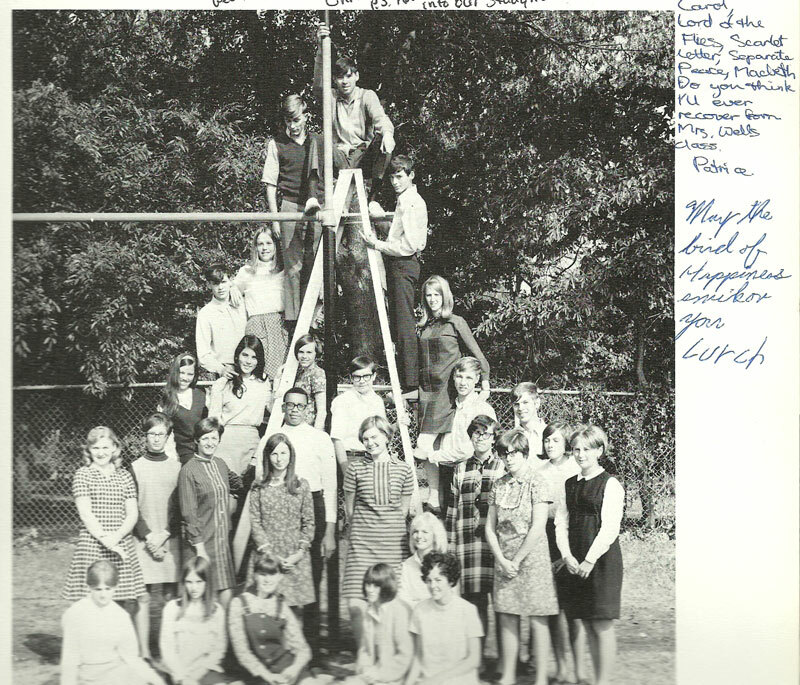 Take, for instance, this group shot of my homeroom class that appeared in the 1969 edition of my high school yearbook. Note that there are definitely two, possibly three, obscene gestures. Indeed, this particular yearbook is positively filled with obscene gestures that passed muster and weren’t censored. 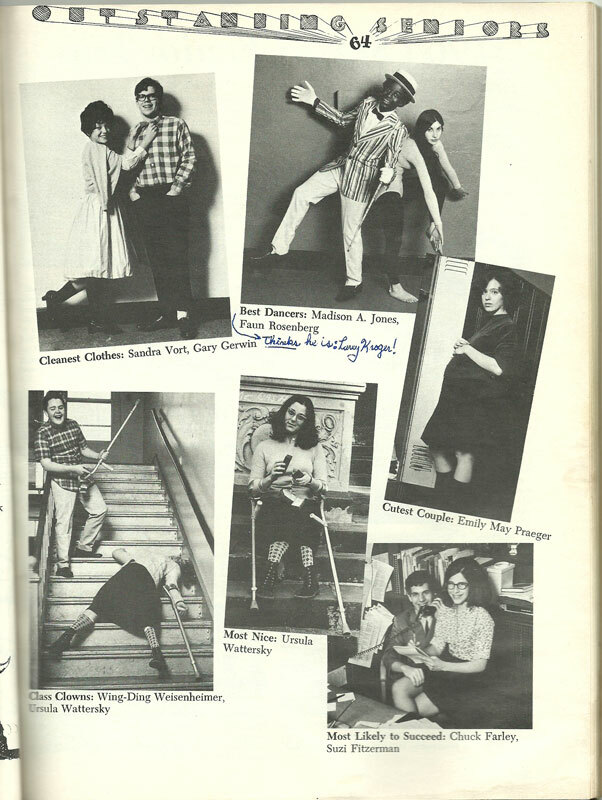 I think I have now established the fact that high school yearbooks always have appealed to me, so you can imagine my delight when National Lampoon published the National Lampoon 1964 High School Yearbook Parody in 1974. (That’s the copyright date on the old copy I’m looking at. According to Wikipedia, it was published in 1973.) 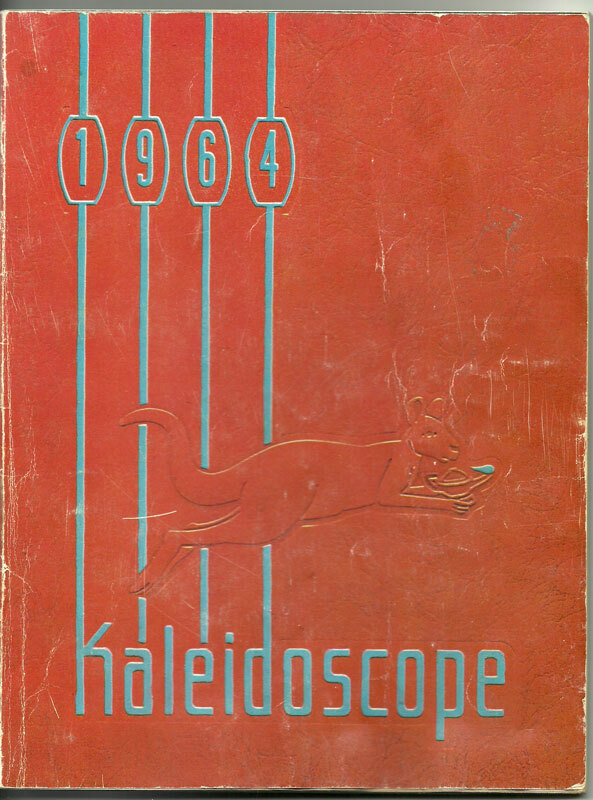 It was a yearbook that was very reminiscent of my brother’s yearbooks of the early 1960’s and really not all that different from the yearbooks of my own high school years in the late 1960’s. Of course, the cover that would be displayed on the newsstand was ever so slightly different. or the “Best of the Class” page. Everything is spot on, from the inscriptions written by students and teachers to the owner of the yearbook, one Larry Kroger, to the local ads at the back of the yearbook. The freshman page is just one example of the depth and breadth of humor throughout the book. Over fifteen hundred teeny tiny faces are crammed onto the page, not one of which would be remotely recognizable without a magnifying glass. Below are the names of the students, names like G. Willikers, V. Neck, E. Leet, T. Bone, B. Ware, and O. Kay. Somehow, you just picture the writers of this parody sitting around a table throwing out every crazy letter and word combination they can think of, each one trying to top the other. While on the subject of the writers, I should note that the head writers and editors of this parody are Doug Kenney, a founder of National Lampoon Magazine and later a co-writer of National Lampoon’s Animal House and Caddyshack, and P. J. O’Rourke, who today is a well-respected author and political satirist. Indeed, O’Rourke got into the spirit of things while working on the yearbook parody and appears as female gym teacher, Miss Marilyn Armbruster. As seen on the activities page below, Miss Armbruster was also advisor to the Hall Monitors. 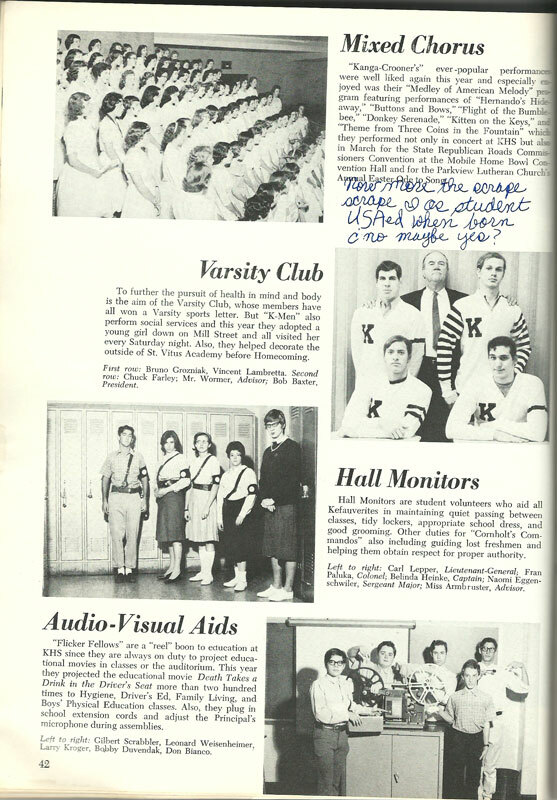 And if that previously mentioned name, Larry Kroger, and the movie Animal House ring any bells, it’s because Doug Kenney used the yearbook parody as a jumping off point for the movie and some of its characters. As if the yearbook isn’t enough, there’s more high school nostalgia at the back of the magazine. Here, one finds parodies of the school’s basketball program, the school newspaper, the literary magazine, the U.S. history book, Larry Kroger’s permanent record and his English IV final exam. 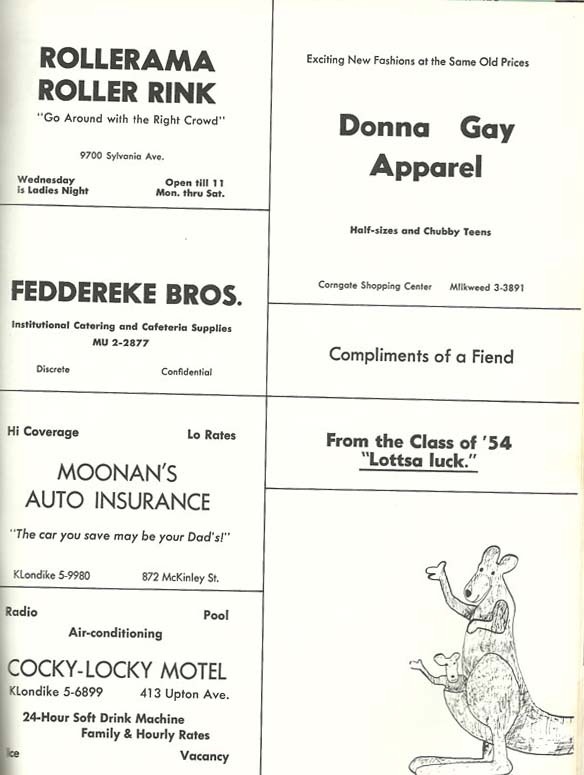 The original price of the National Lampoon 1964 High School Yearbook Parody was $2.50. A few months after its publication, I purchased a copy for a mere $1.25 at a local discount magazine stand where they offered half-price publications with their titles cut off. Considering the number of giggles and guffaws it has produced, it’s absolutely priceless. A few years back, I managed to find an intact original copy in good condition for a few dollars and snapped it up. And just a month ago, I was rooting through boxes of cookbooks at a yard sale when I spotted a rather skinny little paperback book squashed between two larger books. As soon as I read the title on the spine, I scooped it up for fifty cents. Recently, on eBay, copies of the magazine have sold from a low of $3 on up to $60. The average price is around $20-$25. Clearly, I’m not the only one who appreciates the humor in this book. Yes, I like yearbooks, any and all. When I find a real vintage yearbook at a yard sale or flea market that’s $5 or less, I’ll usually buy it. I may keep it or sell it, but I always flip through it and read it. Yearbooks are genuine time capsules of that unique period in life called high school. I’ve never met one I didn’t like, but the one I like the most isn’t a real yearbook at all. It’s an insanely creative compilation of every high school yearbook ever published, and it’s as funny today as it was nearly forty years ago. Thank you, National Lampoon. Whenever I need a good belly laugh, I know exactly where to turn. 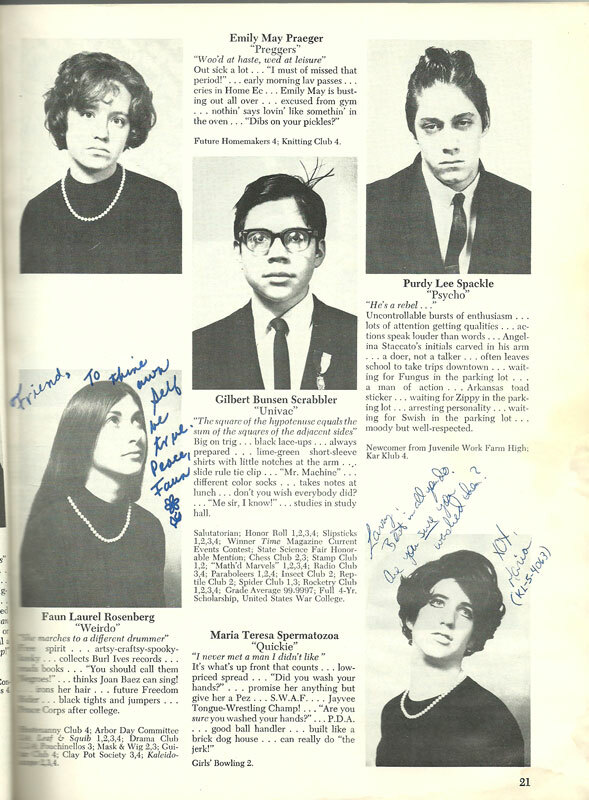 My parents introduced me to the National Lampoon’s hilarious 1964 yearbook parody when I was a junior in high school, at a time when I was already pointing out some of the absurdity in my own yearbooks (although unlike my mom, I did not serve on my school’s yearbook staff). Since then, I have revisited the book dozens of times over the years, only to find new jokes that I somehow managed to miss even after countless readings. I don’t know if the National Lampoon staff thought that nearly 40 years after its publication that people who weren’t even alive to read it the first time would find it funny, but I think it speaks to the concept of yearbooks in general. They are a high school tradition that might change a little bit, but by and large, they are a part of high school that will remain the same and never go away. In my senior yearbook, I used the opportunity to make a few references to this particular yearbook. I said I was frequently seen with Madison Avenue Jones, a transfer student from a pre-Civil Rights era who is almost always obscured in photographs throughout the yearbook. I also said I was a member of our school’s Slide Rule Club, even though I’ve never used a slide rule in my life. Perhaps growing up surrounded by antiques makes me a prime candidate for enjoying something like this that was hearkening back to a bygone era even when it was published, but I get the feeling that anyone who has handled a yearbook (i.e. every high school graduate) can find something like this hilarious. If I had crazy amounts of money to spend on whatever pet project I could conceive, I would build the Estes Kefauver High School and make it into a shrine to this one issue of National Lampoon. That’s how much I absolutely love this yearbook. I have a few friends who have discovered and enjoyed every page and every detail. This is probably one of the funniest things you will ever experience, so if you can’t find one at a flea market or yard sale like we seem to do with a certain regularity, I think it’s well worth the $20 or $25 investment. This entry was posted in 1960's, 1970's, Ben, Carol, Ephemera, Humor. Bookmark the permalink. 6 Responses to The Best High School Yearbook (Parody) Ever! I remember I had a friend who had an older brother who bought this. We were in 9th grade, perhaps, 10th, don’t really remember, but what I do remember, she told me about this hilarious yearbook from National Lampoon. She couldn’t bring it to school because, obviously, it would of been confiscated by the teachers due to the content. This was 70’s, after all. So, one weekend, spent the night at her house, and I remember I laughed and laughed and laughed until I was crying and laughing hysterically, and my stomach hurt so bad from laughing. Just looking at the pages now, I’m laughing hysterically again. I’ve always wanted one and for some reason, looked it up to see if, per chance, they are selling them again. Barnes and Nobles and Amazon sell them, but from third party sellers, and I’ve been reading horror stories about these third party sellers, so I’m leary. If you ever decide you want to sell, it, I’ll buy it off of you, within reason, of course. Thanks for just showing those few pictures. I just bet my sophomore daughter might like it, too, but then again, she’s got a slightly different sense of humor than I do, so she might not get it or appreciate the humor. Please, if you do decide to sell, it, let me know. Thanks. I love the names of the underclassmen: Freida Slaves, Red Roughensore, Shirly U. Geste, etc. I love old yearbooks, too, as long as they’re not MY High School yearbooks! I don’t know why, but older yearbooks bring me fantasies about “ye olde high school days”, while my own yearbooks make me feel miserable. When I was in high school, I used to go to the library after school, and I’d sit for hours, looking at old yearbooks. Once, my choir teacher said that I could take an old choir photo that she was about to throw away, so I took it, feeling super cool about the fact that I owned an item that related to my school’s past, circa about 1988/89.